Steel Shop is equipped with machines which enable working with sheet and section material, bending in both directions, beveling, chamfering and any other type of preparatory operations on plate metal and rolled metal. Shop’s area is 2 800 sq.m. and it is manned with 120 specialists. Production capacity is between 8 – 10 tons of metal per day, depending on the nature of work. Shop’s area, together with foundry and forging area and vulcaniser is 8 400 sq.m. Mechanical shop employs 160 employees. Specialized service station of the Swiss company ABB Turbocharging carries our repairs of marine turbochargers in the territory of Odessos Shiprepair Yard S.A.
Shop works with steel pipes, pipes of non-ferrous metals – copper, brass, bronze as well as of PVC, fibreglass. Shop’s area is 2 800 sq.m. Total length of the quays is 1 153,5m with an average depth of 6,35m. Port depth varies from 5,30m to 9,80m. All quays and docks are provided with main pipelines for acetylene, oxygen, compressed air, water and steam supply as well as with power supply. Shop’s personnel consist of 87 employees – dock foremen, mechanics, electrical mechanics, electrical officers, electricians, motormen, riggers, loftsmen, crane operators, tugboat masters, marine engineers etc. Carpentry Shop is provided with any type of machines required for the wood working and furniture manufacturing. The Shop employs 50 ship carpenters. Odessos Shiprepair Yard S.A. has 17 cranes. Graving dock is equipped with one 30 t crane, two 15 t cranes and one 10 t crane. Floating dock No.2 is equipped with two 15 t cranes. Floating dock No.3 is equipped with two 20 t cranes. 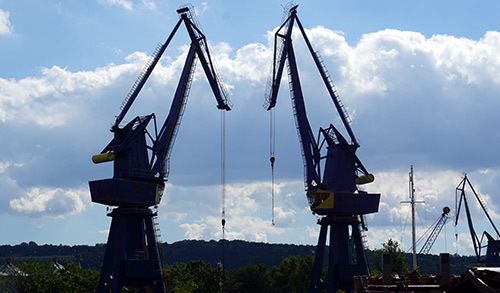 Berths are equipped with five 16 t cranes, one 5 t crane and three 15 t cranes. Also available is a 100 t floating crane.